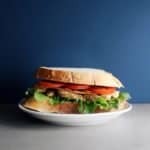 This classic low FODMAP chicken BLT sandwich is perfect for a quiet lunch at home or a quick meal on the go! Cook your bacon pieces in a frying pan until crispy. Pat dry with paper towel and break in half. Toast your bread. Then, add your lettuce, chicken, bacon, tomato, and mayo if that's your thing. Enjoy!